As usual, all times Eastern and almost all predictions wrong. Notre Dame at Purdue (ESPN): Notre Dame reaches for a season of epic proportions! Epically terrible proportions, that is. Sitting pretty at 4-0 is Purdue, which has failed to score less than 45 points a game this year, though to be fair 3 of those teams were MAC schools. Nonetheless, unless the Irish offense has a serious jolt to the heart this weekend, look for the Boilermakers to prevail. Louisiana State at Tulane (ESPN2): While I am not generally a fan of the transitive property of college football, I would like to note that both of these teams have played Mississippi State. LSU shut them out. Tulane allowed them to score 38 points. I’ll predict something similar to occur, and that there will be at least 4 times more LSU fans in the Superdome than Tulane fans. North Carolina at Virginia Tech (Raycom/Gameplan): While UNC has the better quarterback here, VPI has the better everything else. 12:30: Mississippi State at South Carolina (LF/Gameplan): Since Miss State has their SEC win for the year (pending playing Ole Miss), I’m going to go out in a limb here and say they’re probably going to lose this game. 1:30: Oklahoma at Colorado (FSN): You know, this started off so strongly. Well, at least I thought it did. But I’m running out of witty things to say. I even took out the really low-tier games (other than the ACC and SEC Lincoln Financial Sports Games of the Week) to try to thin it out. Now this becoming all self-referential like the Castle Anthrax scene in Monty Python and the Holy Grail. Therefore, let’s “GET ON WITH IT!”. Oh, and OU wins. California at Oregon (ABC/Gameplan): Now it’s time for the ABC SCHEDULING BLOCK OF DOOM! That’s right kids, ABC picked up five games this weekend for reasons unknown. I guess they had a really hard deciding and just said, “ah screw it, let’s just take them all!” If you’re scratching your head trying to figure out what’s going to be on in your area, here’s a map. (Warning! PDF!) Now, to the game! This is actually a pretty important game that will go a long way towards determining who will challenge for the Pac-10 title (though since they play a round-robing schedule, USC will have to play both anyway). These are both pretty good teams, though in terms of OOC scheduling Tennessee is, of course, significantly better than Michigan. I’m not really sure who I like here. I would normally say Cal, but it’s in Eugene so I really think this could go either way. Just for the sake of saying someone will win (and I don’t really keep track of these anyway) let’s go with Cal. Kansas State at Texas (ABC/Gameplan): Since their opening game loss to Auburn, Kansas State has beaten San Jose State and DI-AA Missouri State. Texas got themselves back up on their feet after they nearly lost to UCF by beating Rice like it’s the SWC all over again. Add in the “at Texas” part and the Longhorns will make everyone in Kansas wish the damn ABC stations will switch to one of the four other games available. Maryland at Rutgers (ABC/Gameplan): People in ACC circles keep saying Maryland is still in the race for the Atlantic division crown. I say “what are you talking about, their only two victories this year are over Florida International and DI-AA Villanova and they lost to Wake Forest last weekend.” (Strangely, you could make the same argument about Georgia Tech. Or perhaps not so strangely.) Rutgers is 3-0, but they may as well be 0-0 thanks to a less than convincing schedule (Buffalo, Navy, and D-IAA Norfolk State). It’s tough to say who’s better this year so far. Luckily, they’ll play a game tomorrow and figure that part out for us. I’m going to pick Rutgers. Clemson scores a touchdown to go extend their lead to 24-14 and Tech returns the kick-off from the 20 to about the 50 yard line. 3:11 is on the clock. Reggie tosses up about 3 balls that probably should have resulted in interceptions, but Tech perseveres. Tech gets a first and goal off a pass interference call, one of many Calvin would draw during his career. (This game was his coming-out party.) Tech is running out of clock as Calvin makes his catch on 3rd and goal with 1:50 to go. Tech botches the on-side kick and Clemson gets it on their own 32.5. On first down, Charlie Whitehurt bursts out of the back field and slides down field for a 9.5 yard gain. They measure, stopping the clock at 1:31. Chan calls Tech’s last timeout. 2nd down features Charlie failing to gain the first down on the QB sneak. 3rd down features a hand-off a deep tailback who promptly fumbles. Clemson recovers and elects to punt on 4th down and takes the delay of game penalty. The announcers start to talk about that maybe Clemson should go for the safety here, and in retrospect many Clemson fans probably wish they did. With 23 seconds left, the Clemson long snapper snaps the ball 7 yards, which is about 8 yards short of where his punter is. The punter falls the on the ball at about the 10 yard line. Tech throws the fade to Calvin, which he catches (thus cementing the play as the backbone of the Georgia Tech goalline playbook for the next 3 years). Clemson makes it exciting by retuning the kick a pretty good ways and nearly getting the hail mary, but Tech wins 28-24. 2005. The final score was 10-9, so on the surface that may not sound all that appealing. But it was. An exceedingly intense home game. Here’s what I remember most about it. The boxscore for Clemson’s last serious drive (they had a hail mary intercepted at the end) reads like this for their 4th and 8 play: “Charlie Whitehurst pass complete to Curtis Baham for 3 yards to the GaTch 36.” Astute readers will note that is approximately 5 yards short of what they needed. And I remember exactly what happened. In the maybe 5-6 seconds that play took, I saw the whole thing in slow motion. I imagine this is the kind of thing people who coach and play football feel a lot, but as a random student in the stands that night I saw Charlie Whitehurst look desperately across the field for a receiver. Meanwhile, I saw Kenny Scott wait a few yards behind Baham, practically daring Whitehurst to throw it to his out man. (This is probably the only time I’ve been comfortable with the cushions we give on pass defense.) Out of options, Whitehurst throws the pass. Baham catches. Scott immediately tackles him. Game over for Clemson. Last year, unfortunately, the only thing that sucked more than Clemson’s all-purple get up was us. At the half, it looked to be your typical Clemson-Tech game with Clemson up 7-0. Though Tech would put up a TD early in the 4th, the defense gave in with 58 seconds left in the 3rd as C.J. Spiller busted a 50 yard TD run. The only thing more surprising by the end was that it wasn’t worse. The Clemson two-headed monster ran for 333 yards rushing while Tech had 88, with only 48 of them coming from Tashard Choice. More worryingly, Reggie appeared affected by the leg injury he suffered in the previous game against Maryland and had 12 attempts for 8 yards (though I imagine this includes sacks). Though the Jackets would end up winning 4 straight after this, this is the point in the season where we started to become a little worried about this team, worries that really began to manifest themselves in the 7-0 victory at UNC. While Clemson has feasted off a buffet of patsies since their opening title with FSU, Tech is reeling after two straight losses, one good (BC), and one absolutely terrible (Virginia). As I see it, the only things Tech has going for them here are: a) the expectations are off, at 0-2 in the ACC; b) Choice is supposed to be close to 100% after the hamstring injury suffered against BC; c) the game is not being played in Charlottesville, Virginia. Tech has to be absolutely mistake free (i.e., no muffed punts) and has to have luck on their side (i.e., no freak interceptions) that accounts for 2 of UVA’s 4 touchdowns. It goes without saying we can’t give up 333 yards rushing again. Unfortunately for us, Clemson’s new QB also looks better so far than our new QB. Clemson’s new QB, Cullen Harper leads the conference with a 181.99 QB rating and a 69.4% completion percentage. Taylor is next to last in the conference in both these categories. Injuries are also raving Tech. Although Choice is back, I don’t know how close “close to 100%” is. Tech’s #1 receiver has been injured all year (and missed the 2nd half against Virginia) but is expected to play. Correy Earls, who suffered a neck injury last week, is not. We’re so injured at tight end that former defensive end and Bob Jones alum David Brown will switch between #55 for his offensive tackle duties and #82 for when he lines up as (essentially) an extra tackle. (Look for on-air mentions of Madison, AL, folks! Though it’ll probably never beat when Keith Jackson mentioned Max Martin’s hometown during the 2004 Rose Bowl.) Anyway, I’ve rambled enough. We desperately need to win this game, not only for ACC standing but also for Tech’s bruised pride. (Well, and also bragging rights.) Will the defense look motivated? Will they start tacking people? Will the gameplan be adjusted from last year’s debacle? (Hint: having 8 people in the box is meaningless if 6 of them are on the line.) Will the new QB tear apart our clueless secondary? Will the offense figure out how to convert 3rd downs, stop dancing around the in the pocket, and generally just catch some passes? We all thought that Taylor would need to be a caretaker in this offense, but with Choice hurt we’ve needed him to win some games for us, and it hasn’t happened. Will it? Tune in Saturday! Michigan State at Wisconsin (ABC/ESPN/Gameplan): Whew. Finally done typing out that last one. Anyway, once again I lament the fact that Michigan State is no longer coached by John L. Smith as they go into Madison. Both these teams are decent, but I like Wisconsin better. 5:00: Florida State vs. Alabama (at Jacksonville, FL; CBS): Sweet, an out-of-conference neutral site game in week four! That’s not sarcasm, either. Unfortunately, I don’t like either of these schools and wish they’d die in a fire (as the kids say). FSU has done little to convince me they’re decent, though, so I’ll begrudgingly take the Tide. 6:30: California-Los Angeles at Oregon State (FSN): Probably the 3rd most important Pac-10 game of the day. The transitive property will fail once again (UCLA lost to Utah who lost to Oregon State) as UCLA should probably win. Southern California at Washington (ABC): Washington, after initial early promise, has now dropped games to UCLA and Ohio State. They make it interesting here, but USC heads back from Seattle with the win. Auburn at Florida (ESPN): Florida almost lost to DaCoachO and Ole Miss last week while Auburn did lose to Miss State two weeks ago. (Wacky Season ’07, baby!) Florida, but Florida also should’ve won at Auburn last year. Either way, hopefully it’ll be just as entertaining. Ohio State at Minnesota (ESPN2): Ohio State, going away. That’s it, folks! Also, I should note I’ve updated the bowl predictions section, conveniently located on the right sidebar there. Now updated with all my results from past years! Check it out. This entry was posted in college football, On TV This Weekend on September 28, 2007 by ASimPerson. This week’s gonna be a little different. Normally, I would tell you everything I noticed about Saturday’s action and make stupid predictions for the upcoming weekend. Instead, I’m going to fill this space with even more stupid predictions: I’m going to pick the conference and division winners before most teams have even played three conference opponents. Here I go (in alphabetical order)! ACC: In the Atlantic division, Clemson and Boston College look like the only contenders. Both teams beat NCState by essentially the same score, so it’s hard to say who is better. BC has to travel to Clemson , so I’ll pick the Tigers. In the Coastal division, Virginia, Virginia Tech, Miami all look like possibilities. (GT has two conference losses already with one to UVA, so they are an unlikely candidate.) None of them look that good. Just to be crazy, I’ll go with Virginia. The Atlantic division champion will win the conference anyway. Big 12: The conference champion is pretty clear: Oklahoma will run the tables in the South and continue towards this year’s installment of “BCS Conundrum”. Kansas hasn’t played anyone of consequence yet, but they are the only team in the North to take care of business. I’m going with the Jayhawks here, although Nebraska will probably pull it off. (These predictions are getting more and more ridiculous.) The two face off on November 3. Big East: Connecticut…ha, just kidding. West Virginia will win the conference unless they lose at South Florida this Friday (8 PM ET, ESPN2). They could slip at Rutgers or Cincinnati, but I doubt it. USF has had an early run of success, but I don’t think it will last. Big Ten: Dang. This looked reasonably easy until Michigan beat Penn State Saturday 14-9. That throws the whole Big Ten picture out of focus. I’m not sure how Wisconsin is still ranked in the top ten, because they look pitiful. Ohio State has looked a little better, and Michigan State has squeaked by mediocre opponents. Michigan already beat Penn State, so they look like a safe pick. They should be able to coast until November 3, when they go to East Lansing. Then they host Wisconsin (11/10) and travel to the Horseshoe of Buckeye Stadium (11/17). Lloyd Carr could yet save his job. C-USA: Southern Mississippi or Central Florida could win the East, while Houston or Tulsa could win the West. I bet Houston will win the whole shebang. Not that it means much. MAC: Buffalo (Bowling Green) for the East, Central Michigan (Ball State) for the West. Central Michigan overall. MWC: BYU (UNLV). I’m getting tired of evaluating these second-tier conferences. Pac-10: I’m gonna go against what I know will happen and pick Oregon. They crushed Michigan and took care of their other opponents to date. You probably expected me to pick USC like the rest of the sports media (is it presumptious to place myself in that company?). Before you pounce all over me like a bunch of things that pounce, take a look at the Trojans’ schedule. They have to travel to Oregon (10/27), California (11/10), and Arizona State (11/22). They are basically unstoppable in the Coliseum, but they don’t fare so well on the road. The Ducks travel to Washington, Arizona, and UCLA. I don’t see any stumbling blocks among that bunch. In the East, Florida just tripped against Ole Miss. The Gators have to go to LSU (10/6), Kentucky (10/20), and Georgia (10/27) back-to-back-to-back. Then they get a week off (play Vanderbilt) before going to South Carolina (11/10). I guess Kentucky could be a dark horse; Woodson went crazy against Louisville and Arkansas, and the Wildcats have a favorable schedule. My guess is Florida will pull it together, though. Regardless, LSU will win the conference on their way to their national championship embarrassment of USC (can you tell how much faith I have in my Oregon prediction?). Sun Belt: Troy posted points against Florida and Arkansas and beat Oklahoma State. If they don’t win this conference, something is wrong. Florida Atlantic is the only other team I could offer. Analyzing the Sun Belt feels like such a waste of time, because it is. WAC: Hawaii is the clear leader here, but Boise State could pull another “Cinderella” season (a cliche that should not be used outside of March Madness, although I just did that). The rest of this conference is trash. I can’t believe Hawaii gets a ranking out of this. Well, this has been ridiculously long. See you guys next week! This entry was posted in Uncategorized on September 23, 2007 by Kenneth. 17 years ago this November…. North Carolina at South Florida (ESPN): The OOC embarrassment of the ACC continues as UNC loses to up-and-coming USF. East Carolina at West Virginia (ESPN2): Despite the fact that Wednesday was Talk Like a Pirate Day, WVU rolls. Georgia Tech at Virginia (ESPNU): Dear Raycom, thanks for not picking up this game and showing the next game instead. I would bet money there are more Game Plan subscribers than there are ESPNU subscribers (and I’m in the former group). Anyway, I don’t like predicting our games. But we really need a pick-me-up after last week and we throughly embarrassed this same group last year. Well, they sort of embarrassed themselves. Nonetheless. We really need to win this game after last week, otherwise this season is lost. No pressure, though. And we need to get this damn Charlottesville monkey off our backs as well. Clemson at North Carolina State (Raycom/Gameplan): Let’s see, NCSU is still terrible. Clemson is Clemson. I’ll go with the occasionally purple-clad warriors here. 12:30: Florida at Mississippi (LF/Gameplan): I’m for any game that has the possibility of featuring the spoken word of the Orgeron. Also, Ole Miss lost at Vandy last week – UF rolls. Army at Boston College (ESPN Classic): BC rolls. Michigan State at Notre Dame (NBC): See, the problem with John L. Smith being fired is that if he were still there this game would actually look pretty favorable for ND, since he’s John L. Smith and all. Then again, I guess that’s why they fired him. MSU goes to 4-0 and ND drops to 0-4. South Carolina at Louisiana State (CBS): Slim pickings for the SEC this week if this is the CBS game. I think I’m one of 5-non UF or South Carolina fans that actually likes Spurrier, but if LSU is as legit as they appear this should be absolutely no problem for them. Michigan at Penn State (ABC): Speaking of slim pickings… I can’t conceive of a way Penn State loses here, but like GT going into the weekend they also have a significant monkey on their back. But PSU is good and it’s in Happy Valley. I have to think they win. Northwestern at Ohio State (ESPN): Uh…huh. NU, fresh off their loss to the (not-so) mighty Duke goes to Columbus. I’ll take OSU here. Texas Tech at Oklahoma State (FSN): Mike Leach (arrr! ), fresh off thieving at least 45-points of their cupcakes opponents rolls into a team that claimed, pre-season, to have a superior offense. This supposedly superior offense then proceeded to produce 14, 42 (against FAU), and 23 points, the last in a rout against a team named the Trojans that is not located in Los Angeles. I’ve got a hunch TTU rolls here. Maryland at Wake Forest (ESPNU): Maryland comes in fresh off their now-annual blowout loss against West Virginia. Meanwhile, Wake just picked up their first victory of the year against Army after close losses against Boston College and Nebraska. Neither of these teams has a victory over a significant opponent (UMD is 2-1 but the victories are over Villanova and FIU). This one is too close to call. My heart says Wake, but my head says UMD. 6:00: Kentucky at Arkansas (ESPN2): Fresh off their victory in the Intra-Kentucky Defense Optional Bowl win over Louisville, the boys from Lexington roll into Arkansas for a matchup that should probably see slightly less scoring. Let me also take this time to remind you that Houston Nutt is crazier than a sack of rabid weasels, as evidenced again last weekend. That said, Arkansas is still better than Kentucky. I hope. 7:00: Rice at Texas (FSN): So, uh, remember last year, when Rice had a good season and made a bowl? Yeah, it’s not quite working out that way for them this year, with that 0-3 record and a loss to Nicholls State. Texas wins by at least 3 touchdowns. 7:45: Georgia at Alabama (ESPN): Ah, yes. This game. A game I dread. Whoever wins, we all lose. Since words cannot fully express the reasons why I dislike both these schools and everything they stand for, I’ll just move directly into saying that I unfortunately think one of them will win. UGA has no wins to speak of and Bama beat Arkansas. Curiously, they both scheduled the same DI-AA patsy in Western Carolina – both won handily, but Alabama won, er, more handily. So I guess if someone is going to win, it’ll probably be Alabama. Washington State at Southern California (ABC): Wazzou has a loss to Wisconsin and wins over no one. Meanwhile, in Lincoln USC opened some holes. (That’s 3 links to EDSBS now…) I’d say Wazzou doesn’t have much of a chance. Iowa at Wisconsin (Gameplan/ABC): Iowa lost to noted football powerhouse Iowa State last week. Oh, wait, Iowa State is completely terrible and has already lost to Kent State and Northern Iowa. So, uh, yeah, that’s why the most of the country is getting a Pac-10 game instead. Badgers roll. 9:00: Purdue at Minnesota (ESPN2): What’s up with all the Big Ten games this week? Did the Big Ten network go out of business already? (I know this didn’t, but hey.) Purdue has feasted on MAC patsy, scoring 52 twice and 45 in their 3rd win. Meanwhile, UMN lost at Florida Atlantic last week and lost to Bowling Green. Purdue seems a pretty safe bet here. 10:15: Washington at UCLA (FSN): Going into last week, this had the makings of a pretty decent Pac-10 matchup. Washington losing to Ohio State is understandable. 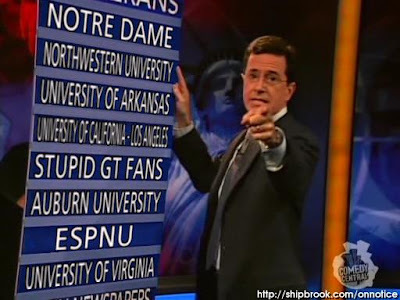 UCLA, however, pulled a “Georgia Tech at the 2005 Emerald Bowl” getting Ute-owned 44-6 last week. Whoops. Washington resumes their previously good season and hopefully takes the victory here. Anyway, I realize this up early. I guess TAMU at Miami may be worth watching tomorrow night, but probably not. Anyway, I’m out. This entry was posted in college football, On TV This Weekend on September 20, 2007 by ASimPerson.